Former Macomb County Trustee Dino Bucci is being allowed to travel to the Dominican Republic as he awaits trial on corruption charges. 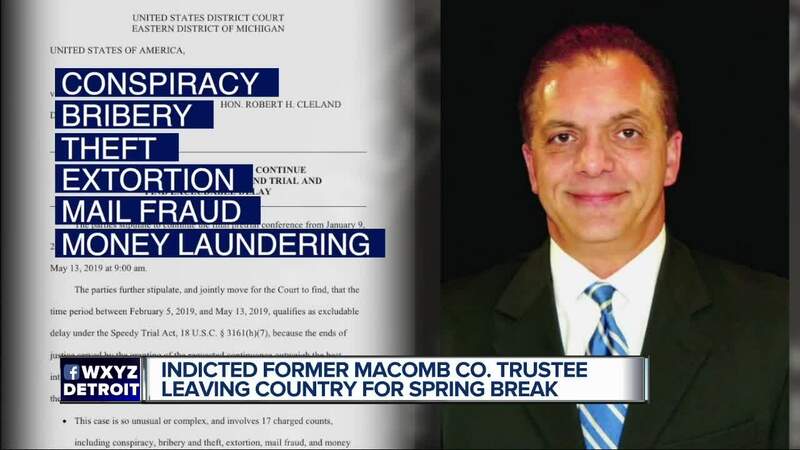 (WXYZ) — Former Macomb County Trustee Dino Bucci is being allowed to travel to the Dominican Republic as he awaits trial on corruption charges. According to a filing in the US District Court for the Eastern District of Michigan, federal prosecutors did not object to Bucci's trip. The order describes it as a Spring Break trip with his son and several other students and their families. Bucci will be allowed to leave the country from April 19 to April 26. He has been charged with conspiracy, bribery, embezzlement, extortion, mail fraud and money laundering. Bucci was indicted by a federal grand jury about 18 months ago.